By N. Sivasothi, 22 Jul 2011. A symbolic scene greeted me on my field trip yesterday morning. The Malaysian (Keretapi Tanah Melayu or KTM) railway I crossed each time I ventured into Mandai mangroves since 1987 has been cut. The fastening clips have been removed and collected in canvas bags along the railway. All this steel will be returned to Malaysia. By Daryl Chin and Sia Ling Xin, The Straits Times, 3 Jul 2011. It was a scene Singapore has never witnessed: Scores of people strolling along the railway tracks that run from Woodlands to Tanjong Pagar. Yesterday, a day after the authorities announced that it would allow the public access to most of the 26km track for two weeks, hundreds of people turned up at different sections of the route throughout the day. The Nature Society (Singapore) led an organised walk, with about 60 of its members trekking 6km from Bukit Timah to Ten Mile Junction. By Jamie Ee Wen Wei, The Straits Times, 2 Jul 2011. TANJONG Pagar Railway Station may be closed and work to remove the tracks is under way, but it is not the end of the road yet for railway buffs. In response to requests from the public, the entire line of railway tracks will be open to the public from now until July 17, except for a few areas. After July 17, a 3km stretch of tracks from Rifle Range Road to The Rail Mall will continue to be open until July 31. A joint statement from the Singapore Land Authority (SLA) and the Urban Redevelopment Authority yesterday noted that as agreed with Malaysia, Singapore will remove the tracks and ancillary structures of the KTM railway and hand them over to Malaysia. The SLA will start these removal works as well as do maintenance works shortly. By Singapore Land Authority and Urban Redevelopment Authority, 1 Jul 2011. The lands previously occupied by Keretapi Tanah Melayu (KTM) for railway use have been vested in the Singapore Government with effect from 1 July 2011. As agreed with Malaysia, Singapore will remove the tracks and ancillary structures of the KTM railway and hand them over to Malaysia. The Singapore Land Authority (SLA) will commence these removal works as well as conduct maintenance works around the various railway sites shortly. Nevertheless, in response to requests for an opportunity for the public to trek along and experience the tracks, the SLA will be staging its works. From 1 Jul 2011 to 17 Jul 2011, the entire line of railway tracks will be open to public for 2 weeks, except for some localised areas. Letter to TODAY by Liew Kai Khiun, 22 Jun 2011. For the past fortnight, along with Singaporeans from all walks of life, I have been joining the walks along the Malayan Railway tracks organised by the “We support the Green Corridor” group, comprising conservationists and nature experts who are promoting awareness of the need to conserve the line between Tanjong Pagar and Woodlands as a green lung, after it ceases operation at the end of the month. Aside from the stretches of lush greenery along the train line, many visitors have been tremendously fascinated by the engineering structures. These include the levers in the control room of the Bukit Timah Station, the train tracks and the cast-iron Truss bridges on Dunearn Road and Railway Mall on the main line, and the smaller counterparts at Sungei Ulu Pandan and Sunset Way along the defunct Jurong-Bukit Timah line. By Daphne, 25 Apr 2011. Warning: The following post includes gruesome photos of dead animals, which may cause discomfort to some readers. Long tail macaques. Monitor Lizards. The rare pangolin. The common changeable lizard. Various species of snakes. 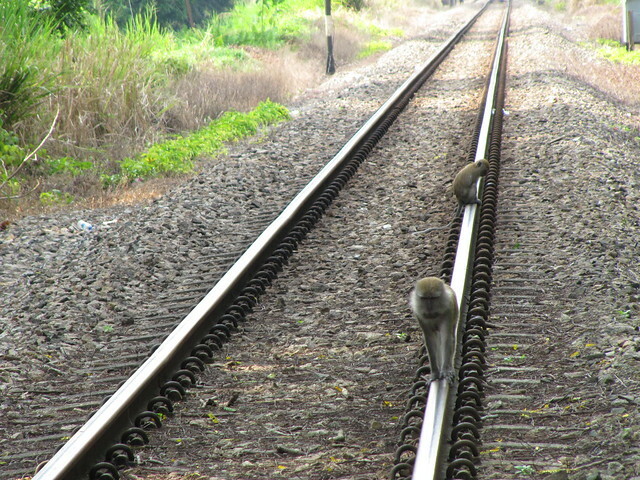 Long tail macaques are a common sight at the Bukit Timah Nature Reserve, of which the railway tracks pass near to the entrance of. These are but a few animals that can be found along the section of the KTM railway tracks that run from the Bukit Timah Railway Station up till the road next to the soon-to-be-converted-into-a-condomium Ten Mile Junction. It’s 5pm in the evening and I’m standing by the window watching the sky turn an incandescent red. It’s my favourite time of the day to simply soak in the beautiful sights of the sun as it sets over the horizon. From a distance, I hear a whirr that gets louder and louder as it approaches – it is the cargo train that passes by behind my house twice a day, every day. There is something most therapeutic about watching the train as it whizzes by, just like on any other day. This was about 20 years ago.